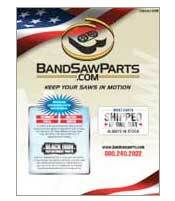 This set of guides will fit the old type of Craftsman 12"machine and the Delta 10" band saws. Suitable for Sears 12" tilting table bandsaw, Dremel 10", and Skil 10" saws. Set includes four blocks, each measuring 3/8 x 3/8 x 3/4. Thrust bearings are usually made of solid steel, ceramic inserts on the face, and no loose bearings. Spaceage Ceramic thrust bearings don't rotate like metal bearings. Should you wear a groove in the bearing, simply rotate it to a fresh portion of the bearing and lock in place. Set of 2 fixed position thrust bearings iOD 1" ID 3/8" x 3/8" Thick ncludes one upper and one lower, and 2 bearing washers.